The Professor Vincent Voelz laboratory has started in August 2011 at Temple University in Philadelphia, PA. Two servers for the Folding@Home project have been set up there and the first simulations hosted on them have started this summer. In the meantime, the team had an acces to high performance computing cluster of Temple university Institute for Computational Molecular Science to generate some initial data for these simulations. 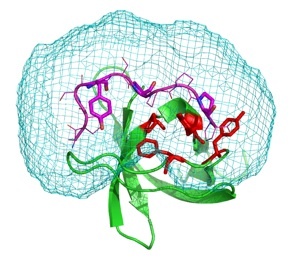 One of the main goal of this laboratory is to use molecular simulations for computational design of folding and binding properties. This design requires folding for lots of different possible protein sequences, which is a natural task for the Folding@Home distributed computing platform. Vincent Voelz’ team works to consolidate Markov State Models of conformational dynamics to do efficient estimation of the effects of sequence perturbations. A good starting point to test these effects are to look at proteins for which many sequences have been characterized, to see if it is possible to predict sequence-dependent changes. Many of these sequence mutations are important in human diseases, so professor Voelz hopes to gain insight into these process as well. High performance computing cluster at Temple University. Understanding the folding of hIAPP, the peptide linked to the Type 2 diabetes Folding@Home 7.3.6 final released, a new website and a video !